Located on Wall Street from 1858 until 1867, the American Bank Note Company of New York was the country's foremost producer of stocks, securities, and other printed and engraved products. 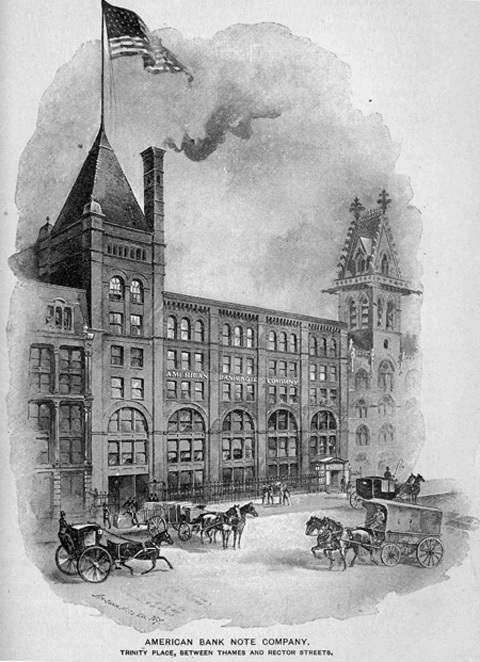 In 1882, the manufacturing moved to 78-86 Trinity Place to serve its Financial District clients from a spacious new high-rise factory of brick and iron with its printing operation in the basement. King's Handbook of New York City described its machinery as "elaborate, complete and costly." The facility had the first electric motors used in connection with bank note engraving.